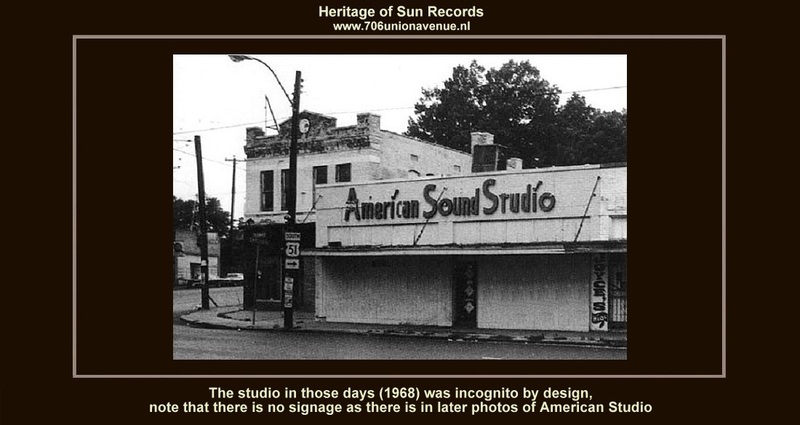 AMERICAN SOUND STUDIO - Located at 827 Danny Thomas Street, at Chelsea Street, in the late 1960s, American Sound was one of the top studios in the country. Founded by Seymour Rosenberg, Charlie Rich's manager, and by Chips Moman, who had built the Stax studio, American got some of the South's best musicians, including Bobby Womack, to work here as session players. From November 1967 to the end of 1970, it placed 120 songs in the Top 20. Hits included Sandy Posey's "Born A Woman", James and Bobby Purify's "Shake A Tail Feather", and Dusty Springfield's "Dusty In Memphis" album. American Sound first found success with hit songs by local teenage bands as the Gentrys and the Box Tops "The Letter", the biggest-selling single of 1976 and 1968, Moman's production technique was simply to tell 16-year-old singer Alex Chilton to say "aeroplane", not "airplane". Elvis Presley came here in January and February 1969, after a 12-year absence from Memphis studios, to record such career-reviving material as "Kentucky Rain", "In The Ghetto", and "Suspicious Minds", America Sounds biggest million-selling number one of alltime. During these sessions Chips Moman complained that Elvis was singing terribly. "When I told him he was off pitch", he told Mojo's Barney Hoskyns, "his whole entourage would nearly faint". Moman, who had the word Memphis tattooed on his right arm, in 1972 angry that he did not receive the recognition in Memphis he felt he deserved, he left, moving first to Atlanta and then to Nashville to produce Johnny Cash and Waylon Jennings. Today, nearly, all the studio musicians and songwriters who worked with Chips Moman enjoys successful careers in Nashville. The studio itself sat unused for many years, a symbol of the declining fortunes of the Memphis music business. For a time, a local promoter operated tours of the building for Elvis fans, but he could not sustain that enterprise. The building was demolished in 1987 to make away for an auto parts store. LINCOLN WAYNE ''CHIPS'' MOMAN – born on June 12, 1937 in La Grange, Georgia, United States, is an American record producer, guitarist, and songwriter. As a record producer, Moman is known for recording Elvis Presley, Bobby Womack, Carla Thomas, and Merrilee Rush, as well as guiding the career of the Box Tops in Memphis, Tennessee during the 1960s. As a songwriter, he is responsible for standards associated with Aretha Franklin, James Carr, Waylon Jennings, and B. J. Thomas. He has been a session guitarist for Franklin and other musicians. After moving to Memphis, Tennessee as a teenager, Moman played in the road bands of Johnny Burnette and Gene Vincent. Settling in Los Angeles, California, he played guitar on sessions recorded at the Gold Star Studios. Back in Memphis, he began an association with Satellite Records (later Stax Records), producing their first hit single, Carla Thomas's 1960 "Gee Whiz''. He also produced the first single for the Stax subsidiary label Volt, "Burnt Biscuits" b/w "Raw Dough'', by the Triumphs, whose members included future Al Green and drummer Howard Grimes. Leaving Stax Records in 1964 after a monetary dispute with label founder Jim Stewart, he began operating his own Memphis recording studio, the American Sound Studio. There he, along with guitarists Reggie Young and Bobby Womack, bassist Tommy Cogbill, pianist and organist Bobby Emmons, and drummer Gene Chrisman, recorded the Box Tops, Bobby Womack, Merrilee Rush, Mark Lindsay (Paul Revere and the Raiders), Sandy Posey (notably "Single Girl"), Joe Tex, Wilson Pickett, Herbie Mann and Petula Clark. Although Dusty Springfield's 1969 Dusty in Memphis album was recorded at American Sound Studios, Moman did not produce the album (that credit went jointly to Tom Dowd, Jerry Wexler and Arif Mardin). During this time, Moman had a record label American Group Records (AGP), distributed by Amy-Mala-Bell. Moman produced Elvis Presley's 1969 albums, ''From Elvis In Memphis'' and ''Back In Memphis'' which included the hit songs "In The Ghetto". "Suspicious Minds" and "Kentucky Rain". During this period Moman co-wrote "Do Right Woman, Do Right Man" (recorded by Aretha Franklin) with fellow Memphis producer and songwriter Dan Penn; and "The Dark End of the Street", which became the best-known song of the soul singer James Carr. During the late 1960s and early 1970s Moman's studio experienced an unprecedented run of hits in the music industry, producing more than 120 charting singles by pop, soul, and country artists. On several occasions during this period, more than 20 of Billboard's Hot 100 songs were produced at American Sound. Moman married fellow songwriter Toni Wine in the early 1970s. He left Memphis in 1971 and briefly operated a studio in Atlanta. He then moved to Nashville, where he produced and cowrote a hit for B. J. Thomas, "(Hey Won't You Play) Another Somebody Done Somebody Wrong Song" (1975). This effort earned Moman a Grammy Award. He also co-wrote "Luckenbach, Texas (Back to the Basics of Love)" for Waylon Jennings, and produced albums by Willie Nelson, Gary Stewart, Tammy Wynette, Ronnie Milsap and Petula Clark. After a brief return to Memphis in the mid 1980s, during which time his attempt to open a new studio floundered, he settled in LaGrange, Georgia, where he operated another recording studio. 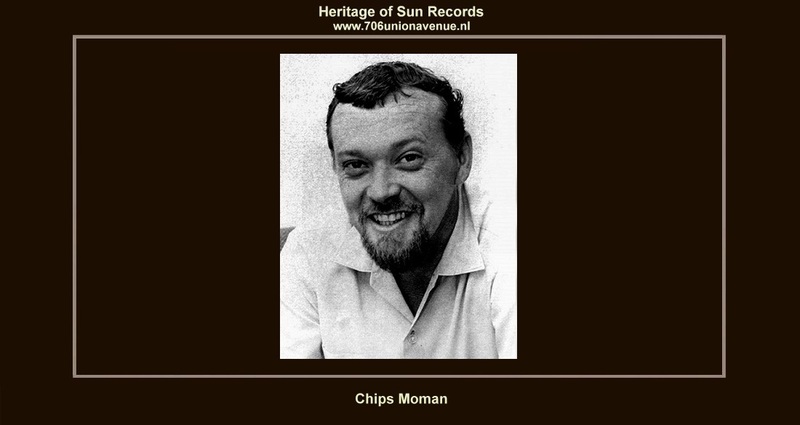 Chips Moman was maybe the best producer Elvis Presley ever had. In poor health for much of the last decade, Moman would make occasional public appearances, performing with the American Boys or at Elvis-related events. In the summer of 2014, Moman and company were finally given some long overdue recognition in the Bluff City. A Shelby County historical marker was placed on the site where American Studios once stood. Moman was also inducted into the Memphis Music Hall of Fame that year. The 79-year-old Lincoln Wayne ''Chips'' Moman died on Monday, June 13, 2016, the day after his 79th birthday, in a hospice in his hometown of LaGrance, Georgia. He had been suffering from a disease of the lungs.